This is the typewriter for all your writing needs. The Olympia SF Deluxe has a strong, authoritative touch, giving you the confidence to tackle any project. Olympia marketed the SF as a lightweight typewriter for personal correspondence, but make no mistake, this is a heavyweight ready to fight in your corner and take on the big boys. It has all the guts of its bigger brother, the SM9, but packed into a sleek body that doesn’t dominate your desk. If you write on a laptop, you’ll feel right at home on this typewriter with its low-profile design. Take it out whenever the mood strikes. The typeface, like all Olympias of this vintage, is bright and clear with perfect alignment, making highly readable copy. While the SF typewriter is in the ultra-portable category, don’t expect a feather in your bag, this is a heavy lug. But the brawn under the covers is worth the extra weight. On the downside is the tiring carriage shifted mechanism, which means when you hit shift, you need to lift the entire carriage, rather than the lighter type basket. But unlike the Olympia SM3-7s, which are also carriage shifted, the SF is much easier on the fingers and not as heavy. While the Olympia SM9 takes the ease-of-use prize, when Olympia finally went with basket shifting. Worth mentioning is a comparison with the Hermes Rocket, another fine ultra-portable. The biggest functional difference, and this is big, is the line space lever, which is used to advance to the next line. On most Rockets, until early-1970s, the line space lever is a stubby little thing that’s hard to catch with your fingers. Hermes finally made this bigger on its 1970s model, but by that time, the Rocket’s shell and frame seemed to have cheapened, lacking the solid feel of earlier models. The keyboard touch on the Rocket feels lighter than the Olympia SF. While lighter can certainly seem better, it can also lead to a less convincing performance, and the Rocket lacks the authority the SF seems to possess. But for sheer portability, the Rocket is ready to go wherever you go, with its lighter frame and integrated snap-on shell, you can feel confident tossing it in the bag or the back of the camper. But if all you’re doing is stowing it under your desk or in a drawer, the Olympia SF will do just fine. And that’s where this typewriter shines, big performance in a small package. Oh yeah, one last cool feature, whenever the typebars get jumbled together, instead of picking them apart with your fingers, simply hit the margin release key, and the typebars return to their place in the basket. 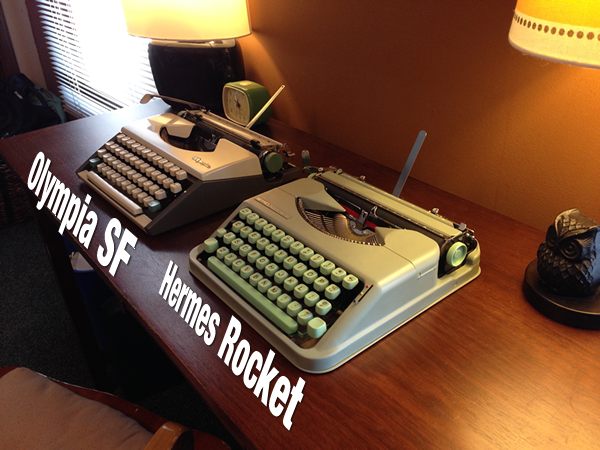 I just happened across your post, when trying to describe the Olympia SF to a friend … and what do I find, you displaying two of my three favorite portables; the Oly SF, Hermes Rocket, but no Smith-Corona Skyriter. In any event, regardless of your clear oversight (hyperbole), I enjoyed seeing another SF fan sing their praises. I LOVE my SFs. Hi! I’m so happy to have come across your post. My son bought me an Olympia SF De Luxe with Leather Case, Manual and working ribbon cartridge for my birthday a number of years back (with manual) and still have her. She’s in fabulous condition and works great, although I will need to replace the ribbon real soon. Do you happen to know what year this beauty was manufactured, according to the label was distributed in the US by Intercontinental Trading, New York. Not sure where the serial number is on the SF. Probably on the carriage rail would be my guess. just bought one of these in the UK via a local ad for £30 (serial number 95-655238, which I think = 1963). It was still in its original case, with original documentation, and apart from a tiny scrape where the return arm had touched the top dust cover, looked in mint condition. I took it home, cleaned off the accumulated dust and fluff of over 50 years, ran a cloth with some white spirit over the slugs… and she was good to go! Even printing a rather distinguished grey and orange with the installed ribbon, producing print that is perfectly legible until a new ribbon arrives in the post. The whole machine is tight and “snappy” and “eager” to show off what it can do: no problems, no issues, no regrets! There is no time-degraded plastic or discolouration, no “built-in-obsolescence” of any kind. It just does the job it was built for as well as the day it was built – over 50 years ago! Well said, amigo! And good reminder about the “touch” control adjustment. Hi, I am looking for a red/orange model from the 60s. The only ones I’ve seen so far have cursive typeface, was this standard or do they come in regular font also? So I just got one of these off eBay, but I can’t get the carriage to work. I can release the carriage with the carriage release, but it dies not move when I type. Is there a carriage lock? If the carriage is just sliding back and forth “loose” and it doesn’t move when you hit the space bar or type a letter then it is likely that the drawband has either come off and the mainspring has lost it’s tension.. You had best go online and look at YouTube and search typewriter drawband spiring, or the facebook group Antique Typewriter Maintenance group. There is a carriage lock at the left rear of the carriage, which should be in the rear position to type, or forward to lock and center the carriage to prevent escapement damage in transit. But this is no toy — the precision of the copy it produces is exceptional — especially for a compact mechanical.